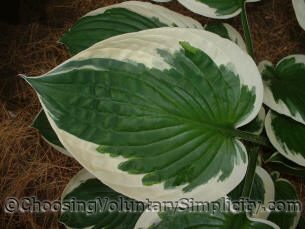 I think Hosta ‘Patriot’ is an especially beautiful hosta because of the contrast between the very dark green leaves and their pure white margins. I have several Patriots in my gardens and all started with roots I purchased from a local nursery a couple of years ago. Patriot is a sport of Francee, and I have read that when it was introduced in 1992, the first plants sold for $875! Supposedly there was a brief period of confusion when Patriot and another Francee sport, Minuteman, were mislabeled. Although the roots I purchased were clearly labeled as Patriot, I have always wondered if some of them were Minuteman instead, because some of my Patriots have leaves with wider margins than the others, and with some, the leaves are a darker green and the margin is a whiter white… all characteristics of Minuteman over Patriot. Patriot produces a limited number of seed pods, although mine must not know that because they produce an abundance of pods every year, and seeds that germinate easily. The resulting seedlings grow very quickly and have almost black-green leaves. 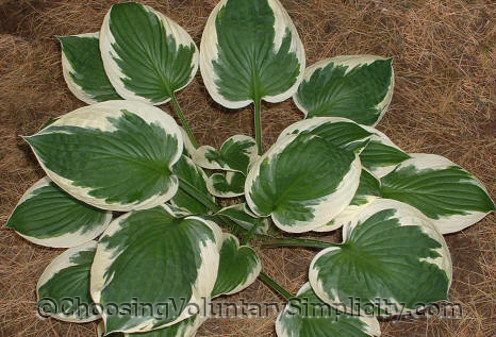 Patriot was the 1997 Hosta of the Year. That’s a great story. I had a very similar thing happen to me several years ago. I also was in a nursery/garden center and I made the mistake of asking the clerk if they had the Thompson and Morgan hosta seed collection. She launched into a long lecture about my mistaken notion that hostas could be grown from seeds. This was the year I had at least a hundred beautiful and varied little hosta seedlings growing at home under lights, and I had pictures in the car. I asked the woman if she wanted to see them. She did… and was she surprised! I thought it was interesting that you think your Patriot and Minuteman hostas might not be what they were labeled. I have what is supposedly a Minuteman but I am positive it is a Patriot because of the color and margins. I took it back to the nursery and compared it to the hostas there, but all of theirs look like mine, and they are calling them Patriots. They don’t have any Minuteman so I couldn’t compare mine to those. I suppose it doesn’t matter really. Both are lovely hostas. Enjoy your site very much. Same thing happened with the Minute Man hosta I bought. I think it is a Patriot. I didn’t buy mine in a nursery though and sometimes the box stores do get the labels wrong. I find some lovely hostas at the box stores. The lower price makes any mislabelling worth it to me and I can always identify them later. Mary – I enjoyed your ‘treasure’.. it reminds me how I feel about my hostas but to comment on your flower stalk…isn’t it beautiful? Your description matches the flower stalk of my little “Holy Mouse Ears” – I actually took a picture last summer because I couldn’t believe it looked so different from most of the other hostas. I also have Great Expectations. Almost lost it last year-replanted in another location…it’s up and looking good. Wish me luck! Joanne: looks like I’ll be spending more time on this site too – not only am I learning (never thought about creating seedlings) but it’s nice to hear comments from other obvious hosta lovers. Since I don’t follow to the letter instructions about where to plant certain hostas (sun/shade) I always push the envelope and find that every hosta I own so far (very small property but today I have 45 different hostas) can tolerate more sun than the info provided with plant. As they say, nothing ventured, nothing gained. I haven’t lost one yet because of incorrect siting.